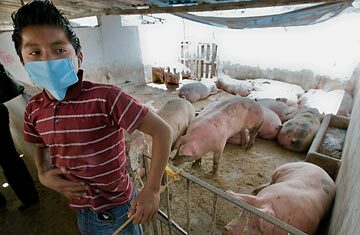 As Swine Flu Eases, Mexicans Ask: Was the Government Lucky or Good? Like a patient suffering from a particularly tenacious case of, well, the flu, the H1N1 virus seemed to gain ground and then lose it over the weekend, leaving health officials cautious but hopeful that the disease might be on the wane. The number of confirmed infections continues to rise, with the World Health Organization (WHO) reporting 898 infections in 18 countries as of May 3, and the Centers for Disease Control and Prevention (CDC) tallying 226 confirmed cases in 30 U.S. states. The continuing spread led Homeland Security Secretary Janet Napolitano to predict on Sunday that the WHO might soon raise its pandemic alert level from phase 5 to the highest stage, phase 6, which would indicate that a full flu pandemic was underway. "The virus has arrived, I would say, in most of the country now," said Anne Schuchat, interim deputy director for science and public health at the CDC. But that would be a mistake. First of all, it's important to understand that pandemic does not necessarily equal apocalypse. A pandemic occurs when a new flu virus emerges and starts spreading easily from person to person, and then from country to country. (To declare Stage 6 for H1N1, the WHO needs to see sustained spread of the virus in multiple regions of the world; so far, that has happened only in North America.) A pandemic doesn't mean that a new virus is unusually deadly, only that it spreads easily  as H1N1 seems to do. It wasn't possible to wait to find out how virulent H1N1 would be before initiating a global response; like a fire department receiving an emergency call, the responsible choice is to snap into action, even if it later turns out to be a contained blaze. The reality is that we live on a planet where new, potentially dangerous diseases are constantly emerging. Over the past six years alone, we've seen SARS, a more virulent bird flu and now H1N1, not to mention countless other pathogens that have escaped public notice but still keep infectious-disease experts lying awake at night. Thanks to the efforts of the WHO, we've built a remarkable early-detection system for new diseases  one sensitive enough to catch major threats and minor ones  and we should be rational enough to heed its warnings without acting as if the sky were falling. President Obama, in his weekly address on May 2, put it best: "Because we have it within our power to limit the potential damage of this virus, we have a solemn and urgent responsibility to take the necessary steps. I would sooner take action now than hesitate and face graver consequences later." Better safe than sorry  when it comes to diseases, it's as clichéd as washing your hands, and just as smart.